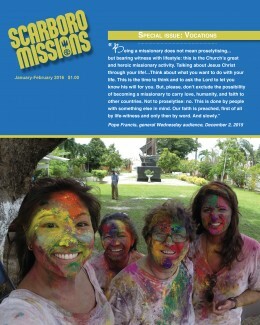 In this issue, you will read articles from Scarboro priests and lay missioners, those working in Canada and those working overseas, as well as articles from former Scarboro lay missioners who were overseas, have returned to Canada, and are now engaged in ministry at home. All are living their own specific call and there are many different avenues for ministry both locally and globally. The stories in this issue also speak of discernment and we hope they will help you to follow your path in search of a life of passion, purpose, and joy. We especially invite you to consider Scarboro Missions One-Year Mission Program as an avenue for living out your passion for a better world and a better life for all. Vocations: What would Jesus have me do?